Instead of stuffing a 30-foot long USB charging cable into your couch—the one place your smartphone needs power most—this simple power station stays hidden between cushions so you’ll never have to go hunting for it. 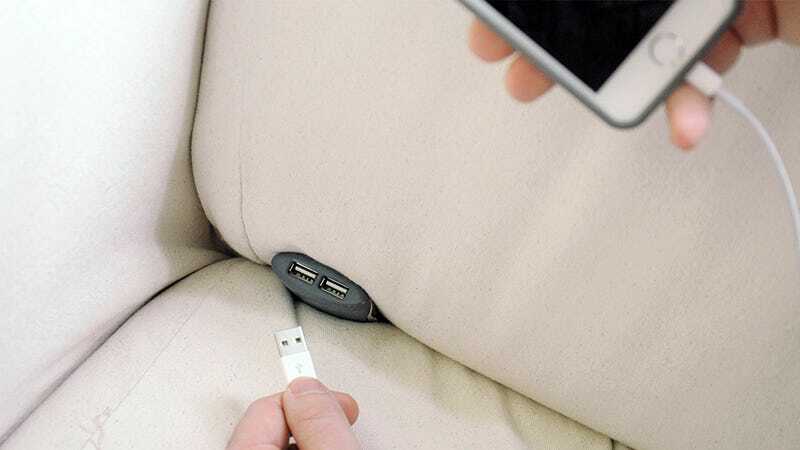 Called the Couchlet, the dual-USB charger features a folding leg that slips underneath a couch cushion (or your bed’s mattress) to help keep the device upright and the ports always easily accessible. When you’ve positioned the Couchlet exactly where it will always come in handy, an included six-foot charging cable can then be snaked under the cushions to the nearest wall outlet for power. The Couchlet’s product shots seem to indicate the device will provide sufficient power to charge both a smartphone and a tablet at the same time, which means two people won’t have to fight over a single USB port while they share the couch.